Another hunting elephants can have disastrous effects on tropical forests. Elephants are important for some trees that disperse their seeds. While this service elephant disappeared, many dominant trees would probably died. This would in forests triggered negative spill-over effects. Elephants eat the fruit of a number of trees and plants. Their seeds then scatter the landscape, along with their droppings. And this is the elephant service group, scientists from the University of Florida. According to them the extinction of elephants tenfold increase the likelihood that over a hundred years to become extinct and some species of trees. "The whole ecosystem is in jeopardy," says Trevor Caughlin from the University of Florida. Caughlin with other scientists examined the contribution of elephants on a Thai tropical forests. "Until recently it was not clear what role the transfer of seeds animals play in the dynamics of tree populations," says Trevor Caughlin. "The tree during its lifetime will create millions of seeds. Just a few seeds take root and eventually replace the original tree. Our study shows that a large role in future tree resistance plays whether it gets to a new location due to transport. " In Thailand, elephants are seen as an important spiritual, cultural and national symbol. At the beginning of the 20th century, their numbers were above 100 thousand individuals. Currently, there survives to 2000. 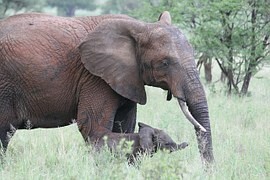 Elephants and other wild animals are under pressure from hunters and poachers, their loss makes even the wild. Caughlin spent in Thailand three years of data collection. Among other things, examined the viability and growth of young trees that took root in the vicinity of the parent plants, and those at their place of growth, has fallen due to elephants and other animals. Your data, then added the data of the Thai Royal Forestry Office of the growth of trees and on these dates then launched simulate long-term development. The result shows that trees that fall into place due to transmission are healthier and more resilient.